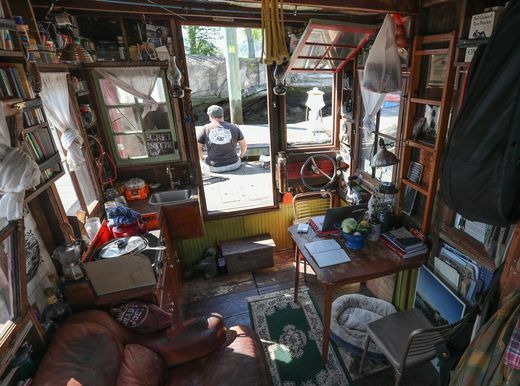 HAVERSTRAW – Wes Modes stood on the bow of his shanty as it bobbed gently at Admirals Cove Marina on Friday morning, a cup of coffee in a mason jar and his four-legged companion, Hazel, at his side. 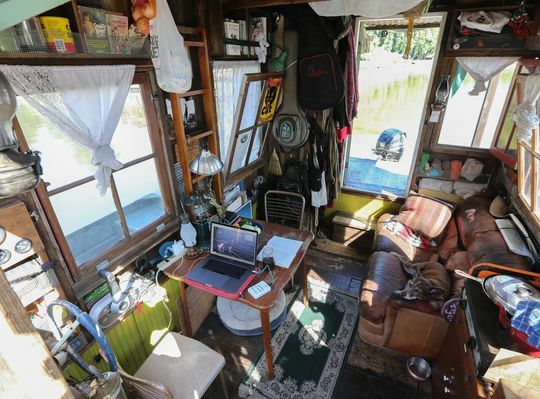 The Hudson is the fifth river Modes has floated down in his homemade floating shanty, a shack built with reclaimed materials. 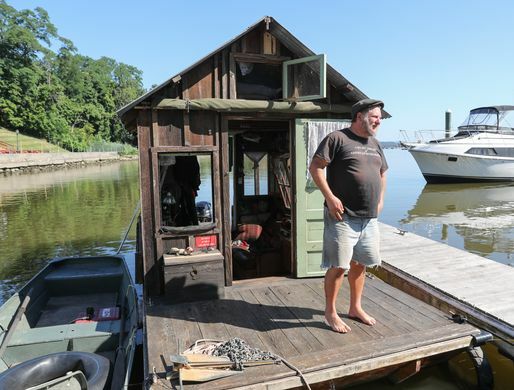 Over the weekend, Modes plans to talk to people in Haverstraw about their river community, and is inviting folks to visit his boat, which will be docked at Emeline Park on Saturday and Sunday afternoons. The exhibition was made possible through the Haverstraw River Arts Fund and the Haverstraw Brick Museum. It’s important to use art to start a dialogue and get diverse parts of the community to interact, and this river project could get people to do just that and also show people outside the community what the town has to offer, said Richard Sena, president of Haverstraw RiverArts and a trustee of the Haverstraw Brick Museum. Sena said that he hoped this exhibition will be displayed next year at the newly renovated Brick Museum, which is set to reopen in September. 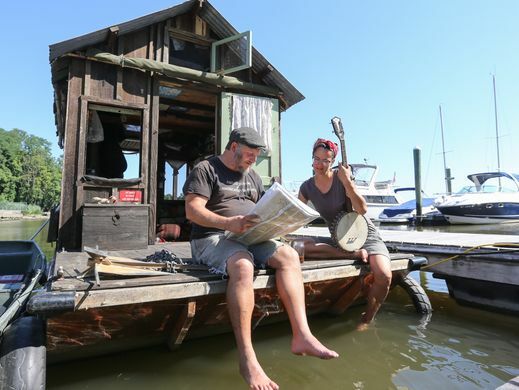 Modes has a background of what he called “punk” rafting, in which he and his friends would build rafts out of trash, truck tubes, construction plywood and other salvaged materials and float down major rivers. 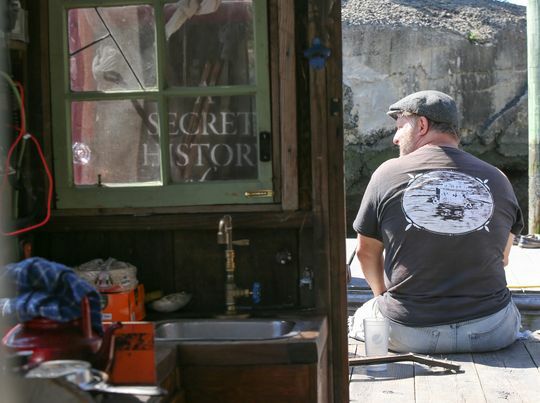 Over gin and tonics, “Dotty,” the shanty boat, was conceptualized. 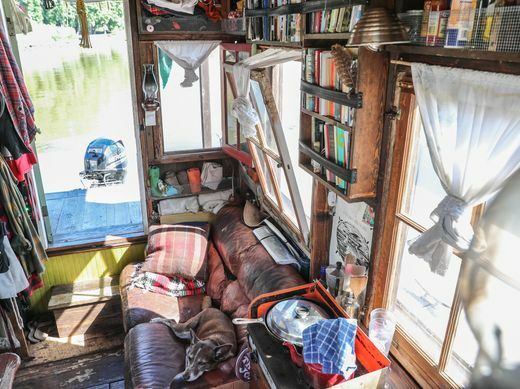 It took two years to build, and he embarked on his first adventure on the Mississippi River in 2014. Along the way, he stops and talks to the people in the river communities. He records their stories. Since he began, he has compiled over 100 videos and has hundreds of hours of audio and video from people he has met along his journey. He posts blurbs on his blog and at the exhibits. Modes embarked on his Hudson River journey on June 24. He will culminate his trip and open an exhibition of the stories in Manhattan and Brooklyn late next week. The exhibition will be at WhiteBox on the Lower East Side of Manhattan and the Waterfront Museum in Red Hook, Brooklyn, starting Thursday. 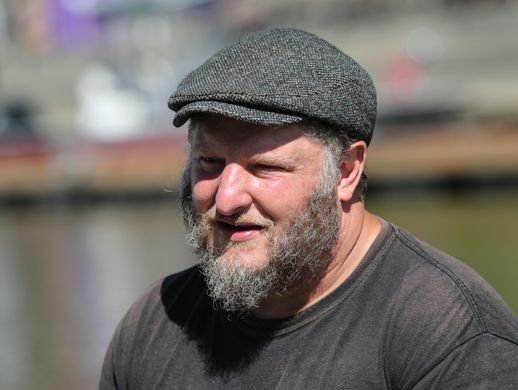 He spends a month to three months on his river expeditions “talking to people and exploring the river and walking around river communities and sharing our observations,” he said. He is sometimes accompanied or joined by other artists. His stories are also cultivated from communities along the Mississippi, Tennessee and Sacramento rivers. He is planning to travel down the Ohio River next summer. Modes spends the off-river months editing the stories, planning the next trip, working on the boat and forging necessary connections. Modes said the project works better as an art exhibit because it lets him work on several levels and connect more inter-personally. 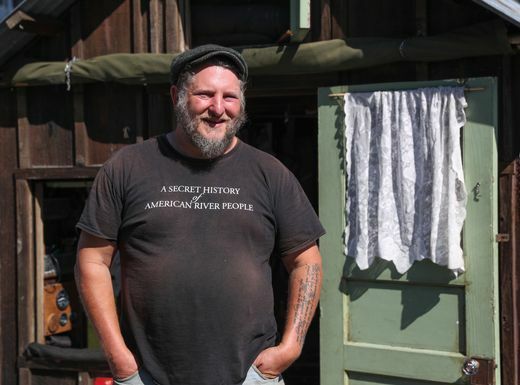 He said by not attempting to tell the entire history of Haverstraw or other river towns, he is able to better tell the stories of the people who live there. “I think it gives, if not a truer picture, I think it gives a more unique picture than if you were to pick up a history book,” he said. Modes said he has already interviewed Virginia “Ginny” Norfleet, a Haverstraw resident with deep roots in the community who organizes the village’s annual Juneteenth celebration celebrating the end of slavery. He said he really enjoyed how his conversation with Norfleet was increasing the visibility of the African-American population that has historically been in Haverstraw. He said this approach also helps him be more impressionistic in terms of what he puts together. 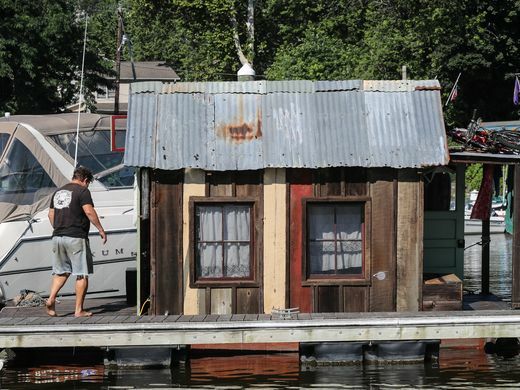 When: Friday and Saturday noon to 4 p.m.
Wes Modes, a Santa Cruz, California, artist, stands on the bow of his shanty boat “Dotty” at the Admiral’s Cove Marina in Haverstraw on Friday.